"S--t!, we're not moving", Matt was shouting. The waves were big, pummeling the bow of our tandem kayak as we seesawed up and down. It was almost 4 PM. Our guide and another pair in our group was already ahead of us, this on the second leg of our kayaking that afternoon. We started out from Bucal Island where we've rested and was paddling on our way to Paradise Beach, more than 2 kilometers on the other side of Cadlao Island, when the winds caught up with us. While wiping away stinging sea sprays away from my eyes, I saw Justin and Susana, another member in our group, giving up on their kayaks and getting on the support outrigger boat that brought them safely to the beach. I was wishing secretly I was there on that banca too. But Matt was determined we could make it. "We're already here, let's go for it! ", he egged me on. "One...two...one...two...one...", we kept repeating this loudly like a mantra as we paddled furiously against waves that were seemingly determined to push us back to Bucal Island. (right) Bucal Island to Paradise Beach in Cadlao Island. 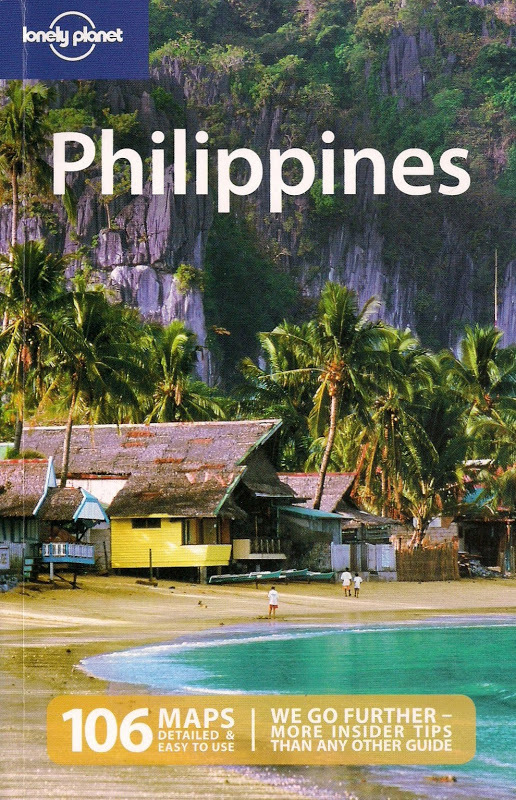 El Nido is on lower right. Map by Google Earth. It was while doing the so-called Tour A the previous day that kayaking became part of my agenda. I wasn't too keen on doing the next most popular "Tour C". Art Cafe was offering a half-day excursion for 1100 PHP including equipment, guide and snacks so I thought of signing up. Matt got interested but we found out that the tour, not part of the standard tours offered in El Nido, needed a minimum of 4 people to operate. We visited one hostel in the hopes of enticing others to join but no one was interested...until we convinced Justin and Susana, a couple who were also with us on the Tour A.
Justin and Susana are Americans working as teachers in South Korea. They're on a 3-month Southeast Asian journey and the Philippines is their first destination (Matt, on the other hand, is a Chinese-Canadian who've been traveling solo for the last 2 months around Southeast Asia as well). It so happened that they haven't decided on what they really want to do so a little bit of talking got them into signing up for the half day kayaking tour with us. With that done, we all ate well as the town was gearing up for fiesta, eating hamburgers before having grilled squid for dinner. The next day, after hiking up Taraw Cliff mid-morning with Matt, we all met again at the Art Cafe. Two European girls joined us at the last minute. 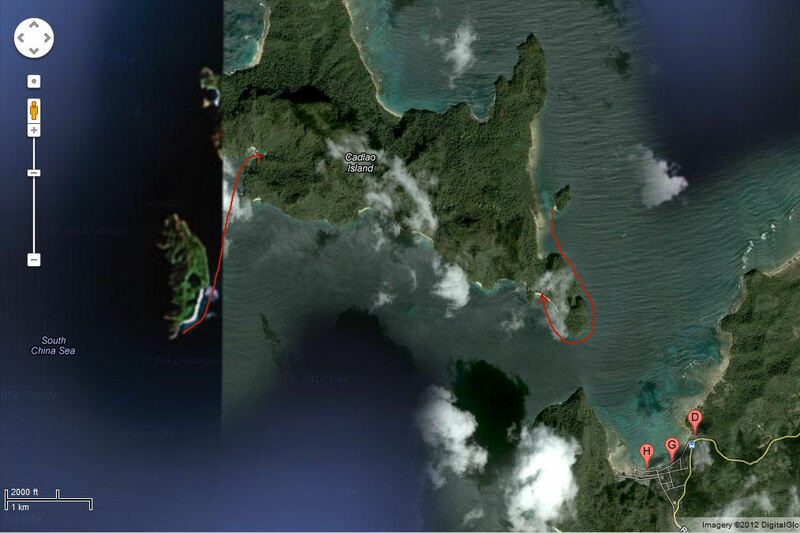 A boatman and a guide brought us to Helicopter Island (locally known as Dilumacad Island) where we boarded our kayaks. We had 2 kilometers to paddle between Helicopter Island and a secluded lagoon in Cadlao Island - the largest island in Bacuit Bay. The water was not calm as we entered the open section between the islands but it wasn't too rough as to impede our progress. It required a lot of muscle work nonetheless. The calm lagoon was a welcome relief from the open seas. We skimmed past limestone walls to hear only the sound of our paddles hitting the water. It was a moment of complete tranquility and awe, reminiscent of what I felt while kayaking on a similar lagoon in Coron seven years ago. Our support outrigger boat was waiting just outside the lagoon, ready to whisk us and our kayaks to another part of the bay. In no time, we made it to small Bucal Island where we took time to rest and just admire the view around us. As we started paddling again, this on the Southeast part of Cadlao Island, the force of the prevailing trade winds (Amihan season) was right in front of us. The waves were forceful and bigger, coming in one after the other that I didn't want to risk taking my DSLR out from the dry bag. Hence no pictures. We were fighting with the current as we paddled parallel to the sheer walls of Cadlao Island and it felt like nature was winning. Our movement was slowed down frustratingly. Justin and Susana, trailing just behind us, soon gave up and had the support banca scoop them up. Now it was just Matt and me left behind. Despite my arms getting sore and numb all at the same time, I summoned all strength I got, paddling in unison with Matt up front. "One...two...one...two...one...two...". It took like forever but we finally found ourselves down the bend, turning westward where the water was getting calmer. From a short distance we could already see our guide and the two European girls ahead of us (what a shame I know!). As soon as we waded into shore, I laid down on the beach. I was so exhausted. Back later in El Nido with sore muscles, I splurged on a 500 PHP massage. It felt so good. Outside was a "feel-good" atmosphere as well, a huge crowd getting ready for the town's fiesta the next day. 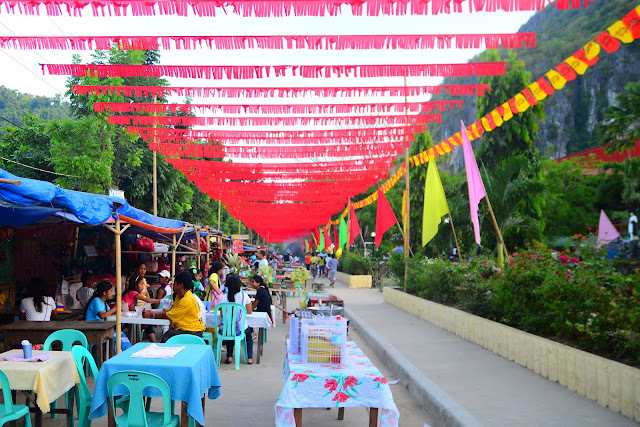 There was a perya (town fair), flea market, live band, street food, even a soccer tournament. Justin, Susan, Matt and I gobbled up again on grilled squid, enjoying each other's temporal company while talking about travel. We're all going in different directions the next day. Wow, I am now getting the impression that El Nido is a place where there's tons of things to do, if you want do them, that is. This was so different from what my family did back in 1998, which, as far as I can remember, it was more like a 5-day R&R in paradise. I'll definitely go your route when I visit again. There will always be more active travelers who want to do something beyond lazing around the beach - thankfully, Art Cafe in El Nido filled that need. 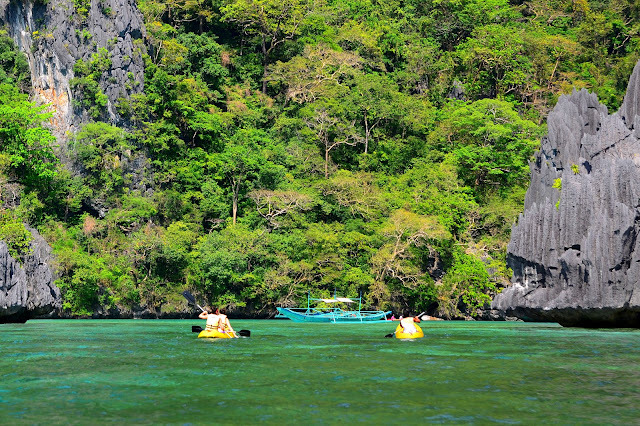 Besides kayaking and diving, they also offer hiking and even rent out mountain bikes! That's scary kayaking with waves. I experienced kayaking in Palawan too (in Coron), water there was peaceful. Always a great moment meeting new friends. Just like you, I never dared using my slr while on boat (bangka or kayak). Some of my photog friends use digicam so I'm planning to buy a waterproof digicam for cases like this. Thanks. I actually have a Dicapac waterproof casing for my DSLR but forgot to bring it with me during the trip (tumatanda na talaga haha!). Buti na lang at pinahiram sa akin yung dry bag. wow the images are outstanding. it's quite scary when the waves are large, i'd have gotten help from the someone :) but that's just me. it's fun to meet new friends/fellow travellers. Salamat Maria. While that second part of our kayaking tour was really strenuous, I wasn't scared even with the bigger waves since we wore life vests and the island wasn't so far. massage after kayaking? your really know how to pamper yourself, dennis. nakakainggit naman those american teachers working in korea with their 3-month-SEA adventure! wish i could have the same holiday, haha! After a rather strenuous kayaking, I was really looking forward to the massage. Mabuti na lang at maraming massage services sa El Nido. Every time I'm in the Philippines anyway, I try to get a massage kasi ang mura! Not like in the US or Europe where it can cost me an arm and a leg haha! Yikes! That's a scary experience kayaking against huge waves! But I guess everything was worth it huh? ;) All for the love of travel! Anyway, that's a scary thing! Kayaking against huge waves. Yikes. But I'm sure that it was worth it!! !